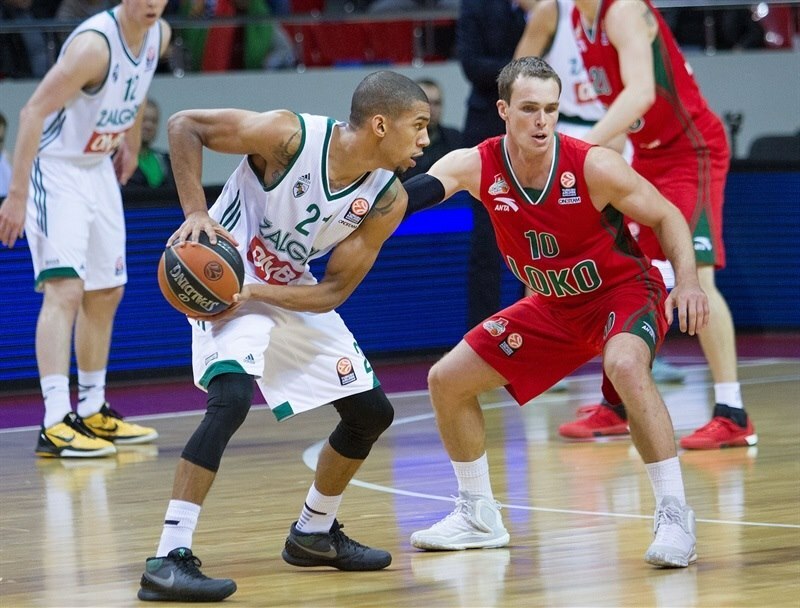 Lokomotiv Kuban Krasnodar jumped into the Top 16 in style with a historic 80-50 rout of Zalgiris Kaunas on Friday evening. 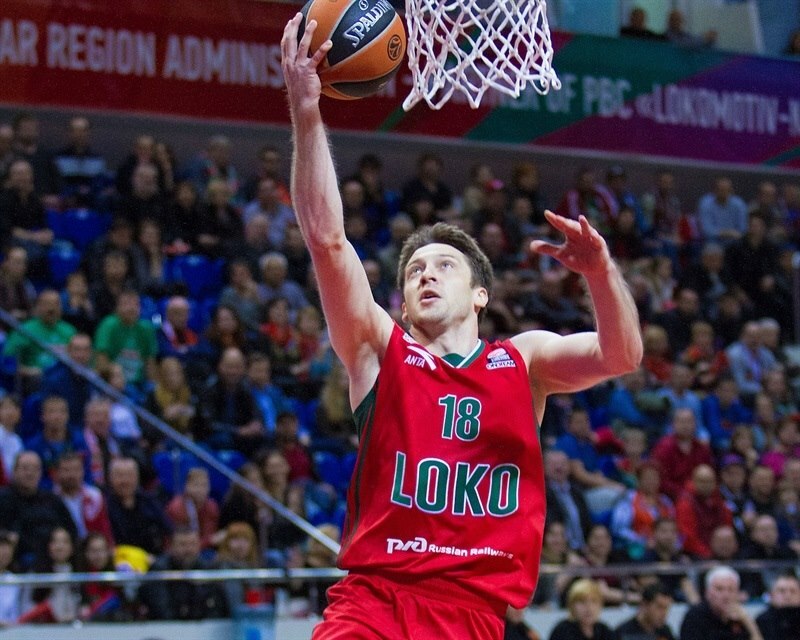 Lokomotiv set a team record for fewest points allowed and came within 1 of the largest margin of victory in the club’s Euroleague history. It also marked the fewest points ever scored by Zalgiris in a Euroleague game. The win kept Lokomotiv even with FC Barcelona Lassa at 6-1 atop Group C, while Zalgiris slipped to 3-4, but will finish the week tied for the third best record in the group. 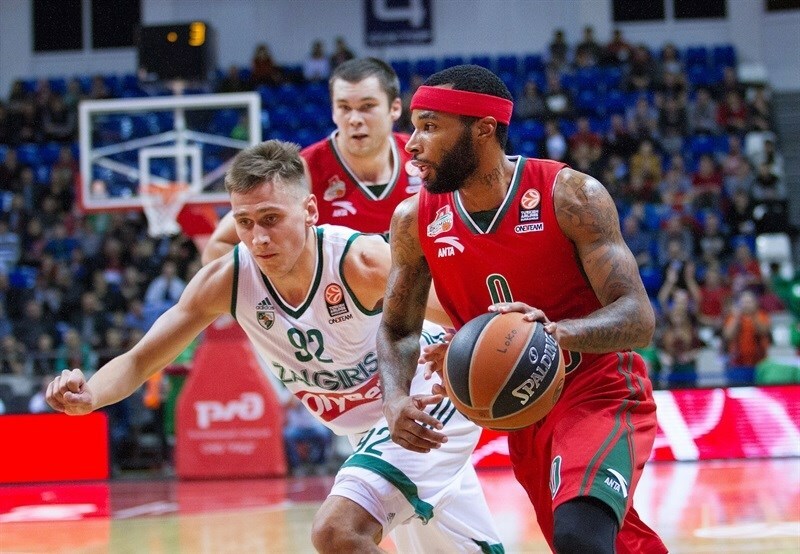 Lokomotiv scored the first 10 points of the game to set the tone and then held Zalgiris to just 3 in the second quarter in building an insurmountable 53-17 lead, which was the third-largest at halftime in Euroleague history. The hosts extended the difference to the 40s in the third quarter and cruised the rest of the way. Evgeny Voronov scored 14 points to lead a balanced Lokomotiv attack. 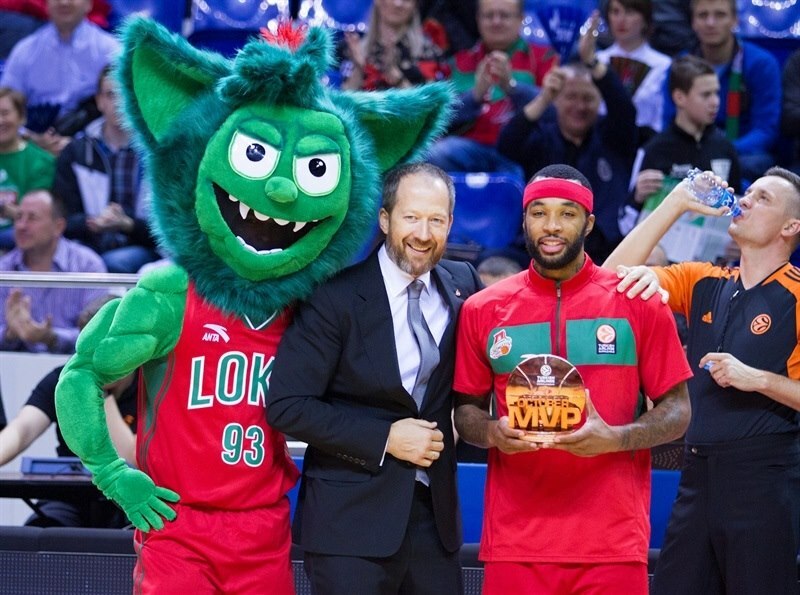 Ryan Broekhoff shined with 12 points and 9 rebounds, Anthony Randolph tallied 11 points and 4 steals in his return to action, Victor Claver posted 10 points and 10 rebounds and Malcolm Delaney, who received the October MVP trophy from Lokomotiv president Andrey Vedishev before the game, delivered 10 points and 6 assists. Ian Vougioukas led Zalgiris with 15 points and Brock Motum added 14. Lokomotiv came out firing by winning the opening tip and getting back-to-back threes from Broekhoff and Voronov. Kyrylo Fesenko scored twice – first with a wicked fast break slam and then a jump hook – to make it 10-0 before Vougioukas got Zalgiris on the scoreboard with baskets off the pick-and-roll. Vougioukas had to take a seat with 2 fouls, but replacement Robertas Javtokas blocked a shot and Paulius Jankunas scored to bring the visitors within 4. 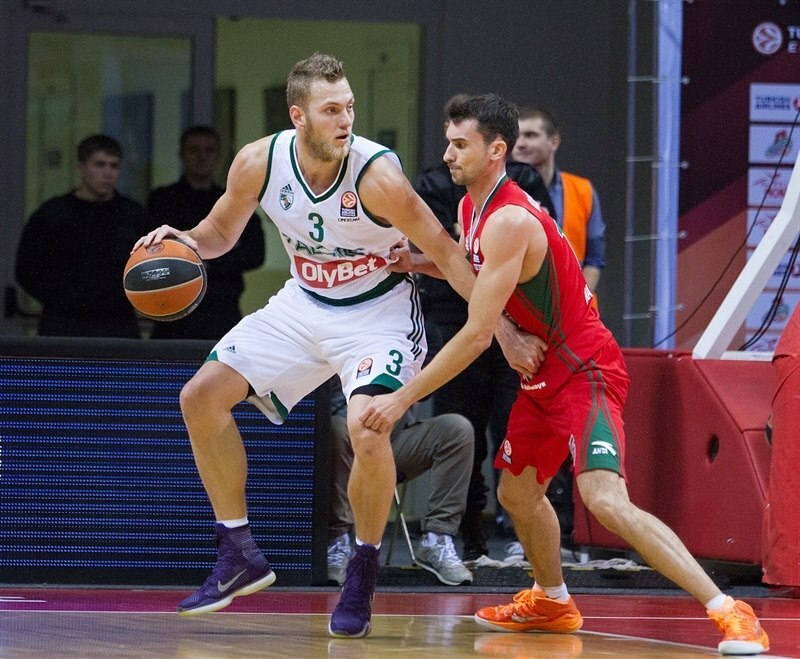 Voronov’s layup and 3 free throws from Broekhoff restored a comfortable Lokomotiv lead. After Javtokas put back his own miss, Delaney’s three-pointer made it 18-8 midway through the opening quarter. Broekhoff scored off the offensive glass and Javtokas netted a hook shot. Delaney and Broekhoff added free throws to stretch the difference to 14. 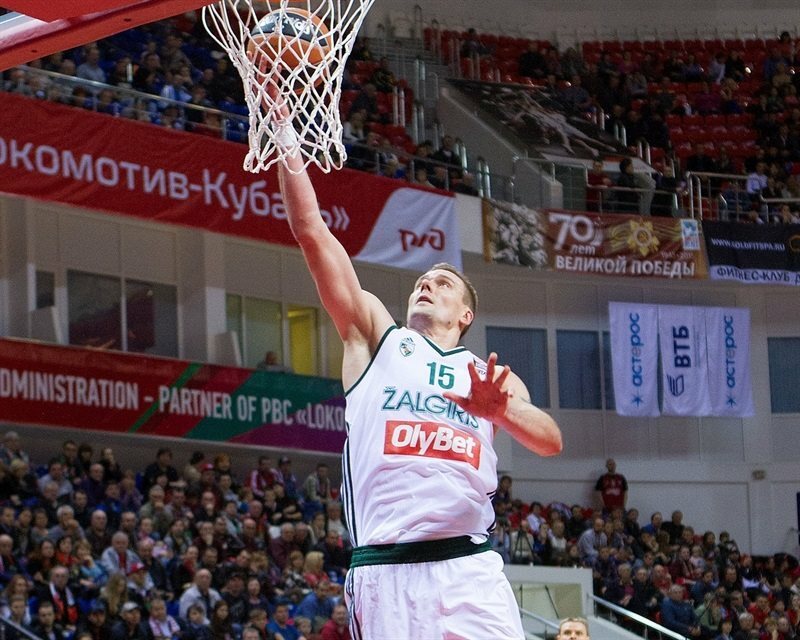 Brock Motum’s put-back and Renaldas Seibutis’s block gave Zalgiris hope. Chris Singleton rose high to reject Motum on defense and then ran the floor to draw a foul and make 2 free throws. Seibutis’s first basket and Sergey Bykov free throws ended the first quarter at 28-14. Vougioukas came back and Seibutis found him open in the paint for an easy score. Dontaye Draper and Singleton each nailed a jumper and Bykov scored as the trail player after Randolph – in his first action of the season – picked off a pass. A Zalgiris timeout was not enough to stop the hosts. 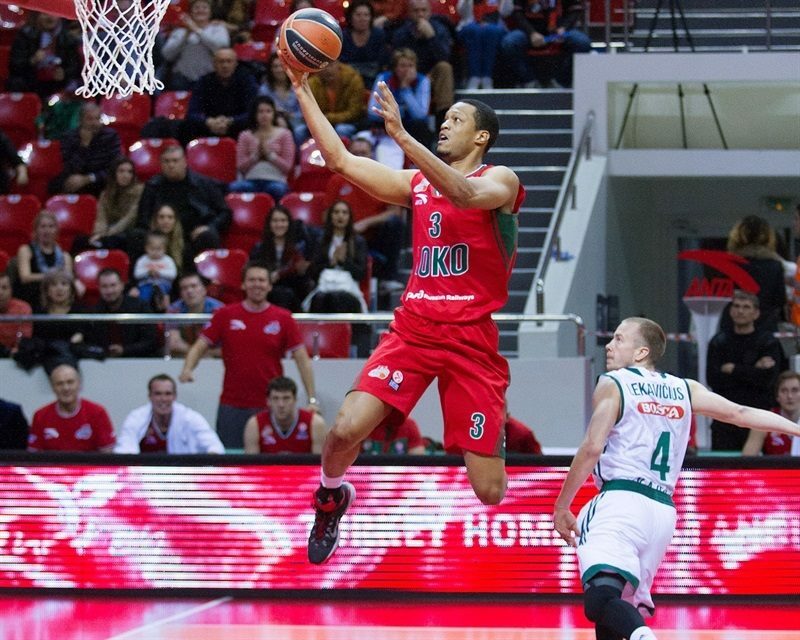 Singleton dunked on Vougioukas and Claver blocked a shot to keep Lokomotiv in command. Randolph’s third steal of the quarter resulted in his first points, a layup. Zalgiris was held without points for seven and a half minutes. Delaney and Claver knocked down threes and Singleton’s layup completed an 18-0 run that made it a 30-point games at 46-16. Jankunas ended the Zalgiris drought with a free throw, but Voronov sank a floater, Randolph drilled a three and Voronov completed an amazing first half with a layup to make it 53-17. Jankunas made a three to open the second half. Malcolm thrilled the fans with a spin move on his way to a layup. Seibutis assisted Javtokas on a layup before Broehkoff hit a pull-up jumper, which made it 57-22 midway through the quarter. After Jankunas added a jumper, Voronov connected on his second three-pointer. 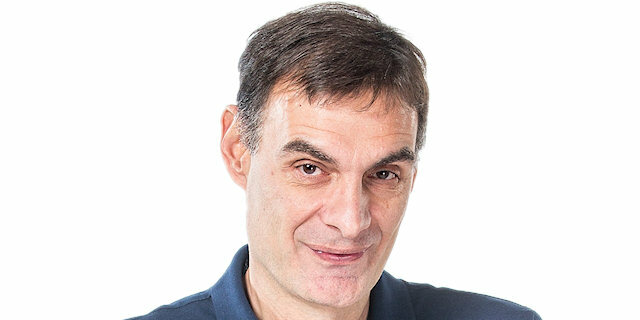 Claver and Randolph made free throws and Vougioukas did that same. 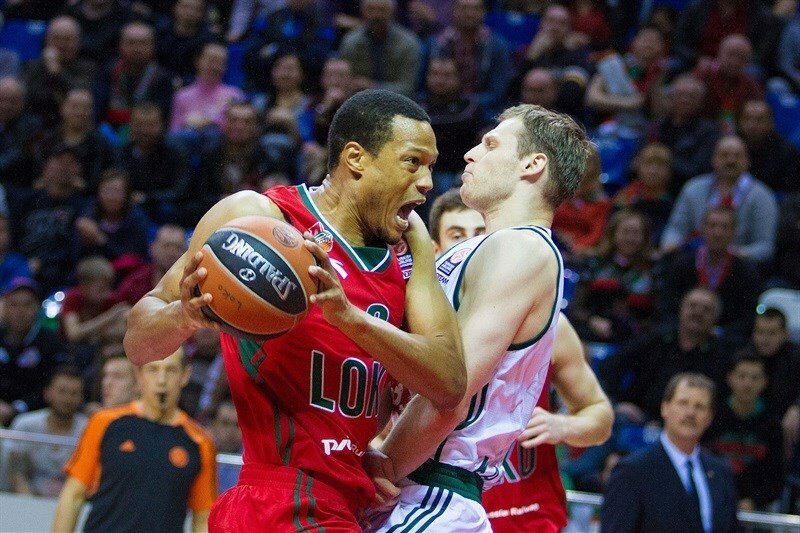 Randolph’s wild reverse layup pushed the Lokomotiv advantage to 40. Vougioukas ended the third quarter with a basket that made it 65-27. Randoplh thrilled the fans with a three-point play and he continued to shoot, though with less success. Vougioukas added a put-back and Motum came down the middle for a lay-up. After free throws by Claver, Motum scored again. Vougioukas and Motum added buckets in a late Lokomotiv rally, but the outcome was in no way in doubt. Claver knocked down a three and Motum reached 10 individual points. 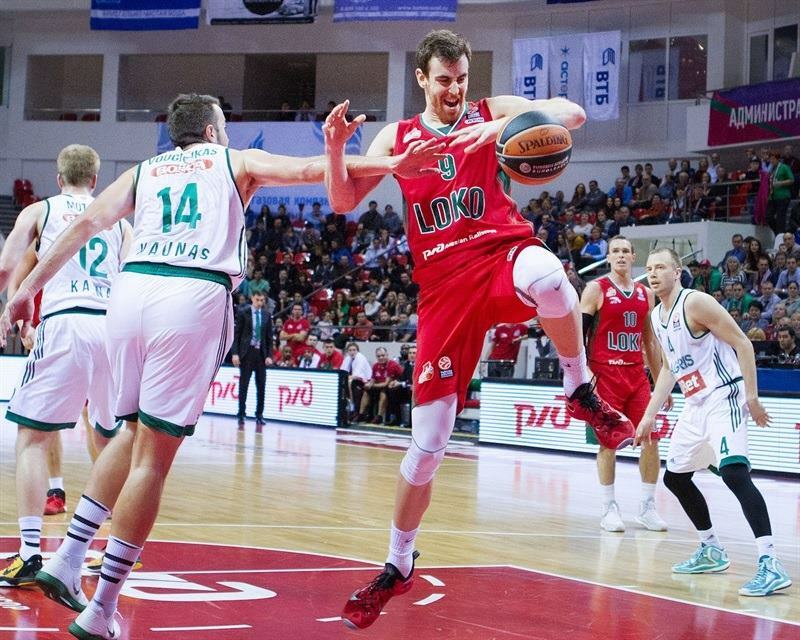 Bykov and Siim-Sander Vene traded threes as the clock ticked away for an impressive Lokomotiv win. "It’s a happy day today for two reasons. 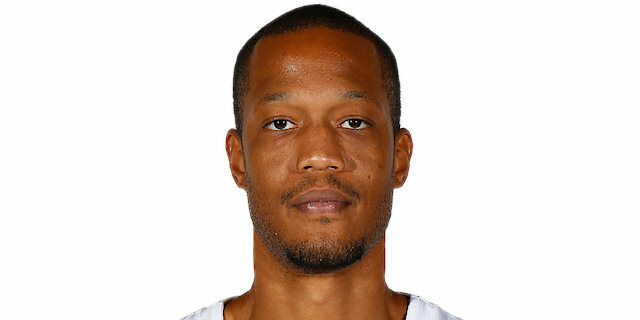 First we got Anthony Randolph back and we’re very happy about it. He needs to get in game shape and we’ll help him with that in the coming games and practices. Second thing is advancing to the Top 16 this early. To be 6-1 after seven rounds is a great achievement and I congratulate our fans, players, my partner coaches, our president and the whole Lokomotiv Kuban organization for that! As for the game itself, we played 20 solid minutes on both defense and offense. I’m happy with the energy our players showed today. After that we cooled down, and it’s normal when you’re leading by 36 points. It’s also normal for the fair play. We have three games left and we’ll try to finish the group stage at the highest place. 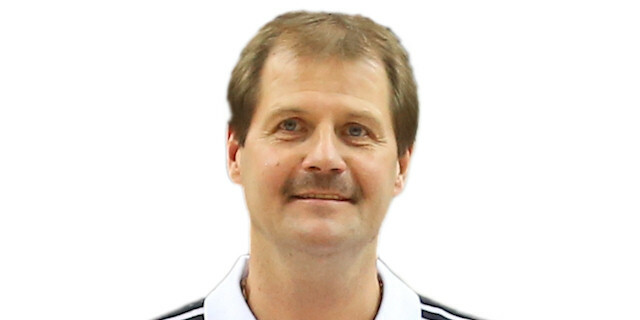 We also need these games to work on our continuity and improve our position in the VTB League." "I congratulate Lokomotiv Kuban and coach Bartzokas for this win and for reaching the Top 16. His team played consistently throughout the whole regular season and in Kaunas as well. It’s hard to change anything when you feel like your team doesn’t believe it can win here from the beginning. We couldn’t hide the fact that Mantas Kalnietis wouldn’t be able to play today or wouldn’t be in good shape, and that’s when I think the players lost faith in themselves. We untied Lokomotiv’s hands from the very beginning and paid the price. It’s not the fact of the loss that makes me sad, but the fact that we didn’t fight." "It was a great team win tonight. We started early on defense, really denied our opponents chances to score and that helped everybody get playing time and helped me to spend more time on the court to feel the rhythm. I think Ryan Broekhoff was huge for us today, knocking down shots and pulling crucial rebounds, but it was overall a great team win. As for me, my health is alright, but I need to get back into playing shape; that’s most important for me right now."